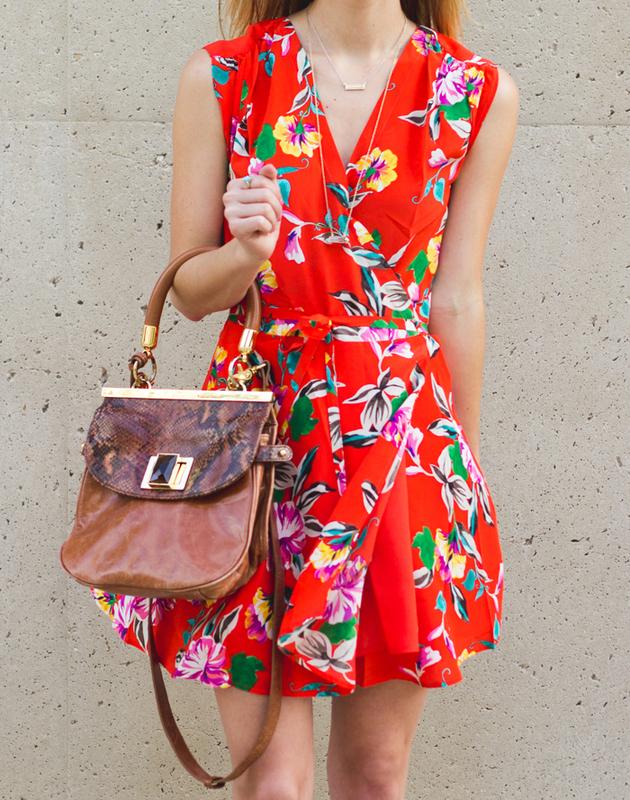 Is this not the loveliest little floral dress you’ve ever seen? I swooned as I pulled it out of the mailbox packaging and I about died when I put it on…this thing is CUTE! If you haven’t scoped out the dress (…and romper…and tank top…) scene over at Yumi Kim, you’re in for a treat. This designer specializes in gorgeous silk everything and just understands how to flatter a woman’s figure. This particular style caught my eye because it really just screams “ADORABLE” from 100 feet away. 😉 I linked to the same style but numerous different prints below, or you can scope out their entire dress selection here. ^^Got a little windy during the shoot…!! No kidding, had about a gazillion Marilyn moments out there! 😉 Ps. This was mid-me quickly holding my dress while trying to get ChapStick out of my little makeup pouch, that wind – ha! This is actually a super comfy wrap dress, so it’s very breezy and easy to wear. I highly recommend wearing undergarments with more coverage though, because a gust of wind proved to be a little dangerous when I wore it during this shoot – ha! The second time I wore this dress I wore little nudie shorts under it and felt so much more comfortable, highly recommended! I accessorized with pink Kendra Scott earrings (who doesn’t love the pink + red combo? ), some fab neutral heels, my trusty Badgley Mischka bag (a classic in my closet, this thing and I go waaaay back! ), and the cutest bar pendant necklace by Anna Beck. The bar necklace is sterling silver and 18k gold over silver, so it’ll withstand time…I love investing in non-fashion jewelry (when my wallet permits, that is!). I really like that print! such a gorgeous red dress! ← Nordstrom Anniversary Sale: My Picks Under $50!